I was a child with diabetes in the 80s so I had my fair share of analog technology to assist me with control. Ketone strips that were used to find high blood sugars rather than glucose monitors that gave results in 5 seconds or less. And if you had a glucose monitor, it weighed 2 pounds and took approximately 2 and a half minutes to produce a result after multiple steps. (And a crap ton of blood.) 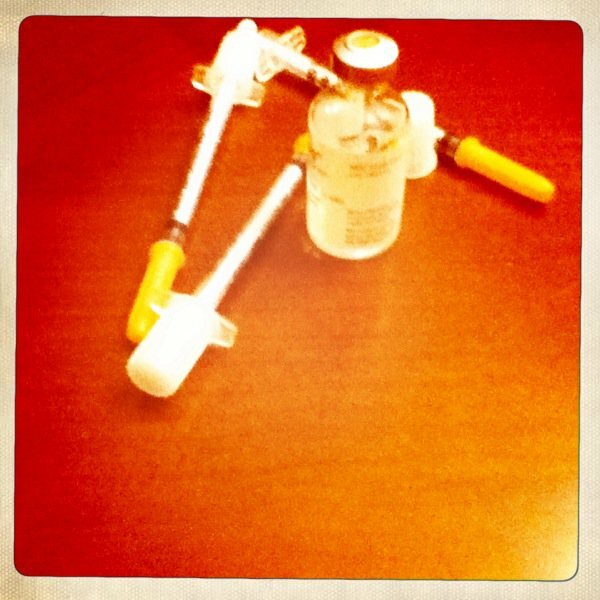 Then there was my insulin regiment of NPH and Regular, given multiple times a day in a syringe. No continuous glucose monitors. Insulin pumps were in their very early infancy. You just lived with what you had and the meager technology that was available was what you used. But it was so simple! Administration was a guarantee with shots. Whether the meds worked or not were a different calamity, but at least you physically drew insulin from a bottle and injected it somewhere. Now days, I have to wonder if my high blood sugars are from a meal, a lack of basal or some sort of pump malfunction. (And that’s just the basics for where a high could come from.) My life seems dependent on batteries moreso than a correct basal rate. I say all this because I finally met with Medtronic again this morning. My CGM transmitter is a dud. I need to send it back after I get my replacement tomorrow. This is probably the reason for most of my CGM woes over the last month. Is this normal? Or do I just have really crap luck with technology? I mean, I work on computers all the time and those don’t crumble to Blue Screens when I walk through the door. I don’t enjoying breaking my diabetes tech. I try not to do it on purpose and I don’t think anyone does. But seriously… this is getting kind of ridiculous. Shots wouldn’t give me calibration errors or beep incessantly. They just did their job and were disposed of. When did this become more complicated? No worries, A. I think it was partly why my pump malfunctioned on NYE, but I don’t think it’s always why. Many athletes, runners, yoga folks, etc use pumps. I just seem to be unlucky. (And I don’t really think I needed the second pump replacement. But I’m not going to complain.) The transmitter was definitely broken this last time though. I’m wearing the new one and it seems to be a bit more accurate. We’ll see.